Simulating stars and galaxies and putting them in the palm of your hand computationally speaking is interestingly complementary to much of the ancient imagery of India, Tibet, etc. Tibetans/Indians used “waking up” as a metaphor for seeing more directly into reality, but we now have many more examples we can use, besides waking up from a dream: realizing that a movie is a movie, getting out of and into virtual realities, so many metaphors that all can serve to help us talk about radically different ways of seeing in a new light what what is already right here. Piets experiments in virtual worlds began with Videoranch (founded by Michael Nesmith, one of the original Monkees, and his wife), and now Qwaq Forums and Second Life. Piet is planning to write a book with the tentative title “Exploring Reality in Virtual Worlds.” He is a professor at the Institute for Advanced Study in Princeton, but is currently logging in from Kyoto Japan where he is involved in joint research with Japanese astrophysicists. In the picture opening this post, by Noelani Lightfoot the proprietor of Quixotic Photography in Second Life (see more of her great work here), Piet and I are at a Go table in Second Life (see the newsblog and the website for a schedule of events). Piet is a Go player (shodan rank in Japan) and at the time of the interview he had just discovered this place, to his delight. Science goes back to astronomy, studying the regularity of the heavens, and moderns science started with Galileo. Yet, though astrophysics is the oldest science, it is the youngest laboratory science. Until half a century ago it had no lab, while all other sciences did. You couldn’t put a star in a lab, or a galaxy. But with the advent of computers, you can, virtually! So experimental astrophysics equals virtual worlds, in fact a virtual cosmos. Piet takes the notion of “the lab” into new terrain. In astro I am putting galaxies and stars in a lab and in WoK we are treating our own life as a lab and virtual words are great labs! We will start putting our N-body simulations in Qwaq and we will also start playing with interfaces to their in-world applications. 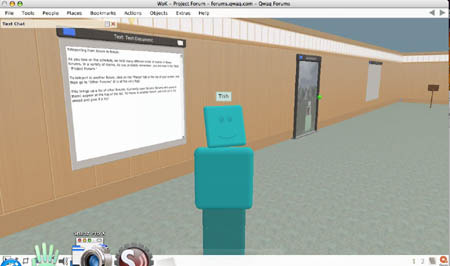 Now from here on, Qwaq will prove to be useful for integrating simulations and avatars, i.e. no more screen dividing scientists and their science. This may be a considerable draw for astrophysicists who will now be able to enter virtual laboratories running real time simulations, produced by a supercomputer, of galaxies “or molecules interacting for that matter” to inspect the results of the simulation, and “even change the way the simulation are run in real time” together with their colleagues in a shared virtual space. The biggest problem in computational science, which is quickly becoming all of science, is to find ways to let scientists write software together. The idea is that if someone uses a legacy code, twenty years from now, and wants to modify a particular function, she can click on a pointer next to the old lines of code and see a replay of the session that produced that code. This will give full disclosure of the original motivation for writing the code, the way in which is was debugged, what considerations came up and were tried out, anything you could possibly have wanted to ask the original writers (except that they by then will have forgotten most of it!). Piet’s commitment to exploring different ways of knowing extends now beyond breaking down the boundaries between science and contemplative traditions. He is also forming groups that bridge virtual worlds. Piet has invited me to join two groups: one is the Qwaq Second Life Liason group, QSL, (more about this later in this post), and the other The WoK Qwaq forum . I will have some first hand accounts of my own experiences bridging worlds soon. My first WoK forum featured a presentation by Dr. Karen Sobel Lojeski, founder of Virtual Distance International, and a discussion of the New York Times article on virtual worlds for children – what the implications of the widespread adoption of virtual worlds by children may be for mind and society, and whether these burgeoning children’s worlds were benefiting children or merely opportunist business ventures. Karen’s book with Dr. Richard Reilly, “Uniting the Virtual Workforce: Transforming Leadership and Innovation in the Globally Integrated Enterprise,” is scheduled for publication in April, 2008, and you can order now on bn.com, amazon.com, or wiley.com. I am interested in the endeavor of working across the disciplines of science and contemplative traditions. But I wonder how the emphasis of many contemplative traditions to go beyond conceptual reality meshes with science. For example, in Buddhism there is a distinction between certainty about the nature of reality and the experience of what reality really is – which is beyond conceptual fabrication. To go beyond conceptual fabrication is to go beyond the language of science, indeed beyond any language. If science made its endeavor the experience of the true nature of reality beyond concept would it still be science? Piet told me that while current science cannot play such a role, he fully expects a future science to be able to do so (see his one-page summary, Beyond Methods and Goals). Let’s build bridges. The human part is always the most difficult, so why not start there scaling the walls. And Qwaq and SL communities have a lot to offer each other. They are totally complementary. Here are some pictures of my first day in Qwaq. I had a bit of culture shock when I checked in and found myself not the rather lovely Tara5 Oh, my Second Life avatar, but a block person. Luckily being able to drag Powerpoint presentations from my desktop onto a wall in a virtual room in one second with one mouse motion saved the day, so I was a happy blockhead. Then I learned how to become a sphere (see picture below) which for me actually felt a whole lot better. There is no rich culture to support avatar identity construction in Qwaq, as there is in Second Life, and without this I preferred to retreat into a non figurative abstraction. Piet came into Qwaq and showed me this nice mirror in the space of Dr. Robert Magrisso, Doctor of Internal Medicine, an avid Qwaqer. In the picture below the mirror with images of our qwaq avatars in it has Dr Magrisso’s paintings to the right and left. There is a reflection of my happy blue sphere. 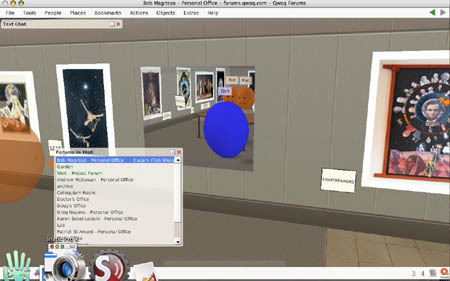 And, Piet and his alt are the orange spheres (you can run multiple Qwaq sessions on the same computer, making it easy to log in with two avatars, or to be present in two Qwaq organizations simultaneously). Second Life the great virtual lab of fairy tale, dream, technology, community and more…. 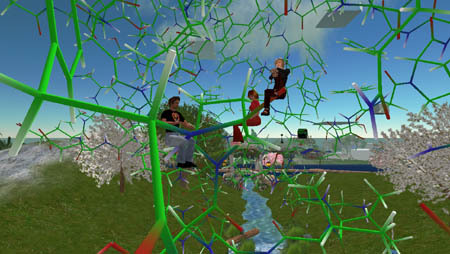 In the last few weeks Piet has expanded his explorations of reality in virtual worlds into Second Life. Though as Pema Pera he was born ten months ago, he was so busy with Qwaq that he had to wait for the Xmas holidays to get acculturated into SL, which has a learning curve steeper than for Qwaq by two orders of magnitude, he said. But now that he’s in, he shows all the signs of being hooked. Second Life as the largest and most popular virtual world, whose rich social structure of networks built around user generated content, is the supreme realm or “lab” to explore, “fairy tale, dream, technology, community, etc., etc, …” and the infinite possibilities of networked human intelligence. Because Kat’s last name is in French, I came up with the name liaison, Qwaq-SL Liaision. Then, with an incredible stroke of good luck, it turned out that QSL, the abbreviation of the group , had a deep meaning in early radio broadcasting, which I did not even know. So then QSL grew very fast. Emileigh Starbrook showed her simulation of an asteroid impact on Mars, an amazing performance. And I got astronaut Ed Lu in at the space station. Kat showed some Qwaqers how to build things in SL. And I got Troy Mcluhan and Kat into Qwaq, in my MICA organization, and now you too, in my WoK organization. The Qwaq Second Life Liason Group, QSL, has grown rapidly and is now holding three meetings a week, each next one roughly six hours later than the previous one, since members span Europe, Asia and North America. I joined them on Wednesday, January 9th for a tour of a replica of Chernobyl in Second Life given by Maxwolf Goodliffe. This Second Life build is part of an effort to raise money for Chernobyl charities. For more about this effort see this YouTube video. Zazen Manbi, who introduced me to Piet, was there for the tour in his yellow protective suit. Piet is in an earlier incarnation of his avatar here – the bearded avatar in a maroon shirt (just before he learned how to shed his noobe image ;>). Zazen, who is Jeffrey Corbin in RL, recently obtained funding for teaching an environmental impact course in Second Life. Zazen is building a virtual Nuclear Power Station in Second Life to help explain and demystify nuclear power and its vital role in controlling global warming. A couple of days earlier, Piet brought his friend, astronaut Ed Lu, into Second Life to visit the replica of the International Space Station that he lived in for a half a year in 2003. Ed Lu and Piet were joined by a number of members of the Qwaq Second Life Liason group. The picture above is from Troy McLuhan’s Snapzilla. Ed Lu is the avatar in the white shirt. 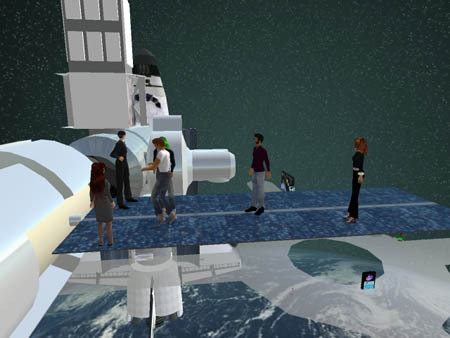 For more on Ed Lu’s visit to Second Life see Kat Lemieux’s post on the International Space Museum blog. Piet and Ed Lu, together with Rusty Schweickart and Clark Chapman, founded The B612 Foundation named after the asteroid that was the home of Le Petit Prince. The goal of B612 is to significantly alter the orbit in a controlled manner by 2015. After the tour of Chernobyl in Second Life, Piet and I talked for a while on the solar panels of the SL International Space Station. Piet described to me how Ed Lu came into Second Life. He had called me on my cell phone from the space station, when he lived there for half a year in 2003 and two days ago I called him on his cell phone from the SL space station. He was so intrigued, he was willing to come over the next day. We had quite a party! After ten minutes in SL he could talk, walk, fly, and have a text based conversation with his admirers while inspecting the space station. These astronauts are really incredible! Ed Lu’s visit gave a very auspicious start to the year for QSL which has taken off at rocket speed – good to have some guidance from an RL astronaut! I am very excited to be part of it. Piet has launched some ground breaking communities in virtual worlds in the last year. I can’t wait to see what happens as they develop and expand in 2008. I think QSL will be visiting the, “The Rhodospin Membrane Protein,” soon. This build on the IBM Research Shared Work Island resulted from a simulation done on the Blue Gene supercomputer. In the picture below, Zha Ewry, Pema Pera and I are sitting in the molecule discussing the meta implications of a visualization of a visual molecule in a virtual world (for more on this build see this post on eightbar, SLNN, and the molecule tour on Destroy TV’s Flickr photostream). Another great post. Keep on coming…. thanks for the Piet Hut article link. 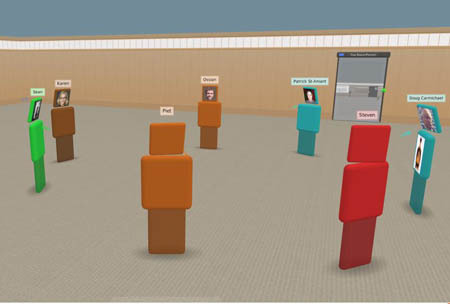 I think there is space for both QF and SL: Second Life is meant as a game-like social VR world with an added (still limited) set of groupware features, whereas Qwaq Forums is a virtual Intranet / Extranet for productivity-oriented groupware aimed at professional users. 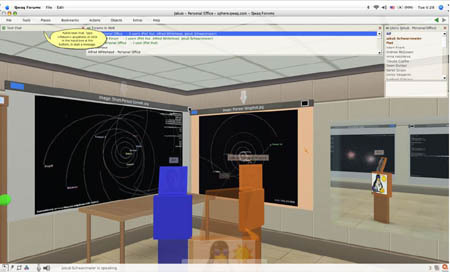 A company or organization may use QF as an internal workspace, training system and meeting space, and SL for public outreach to wider audiences in “fun” game-like settings. Yet it would be interesting to sort of merge the two sets of features at the platform level (one platform for both usage patterns). Perhaps OpenSim? Integrating the groupware features of QF in OpenSim is a challenge, but is certainly doable.